Are you getting ripped off on your car insurance? The 2.0-litre Renault flagship luxury sedan is the tallest, widest and most spacious continental taxi in its class. 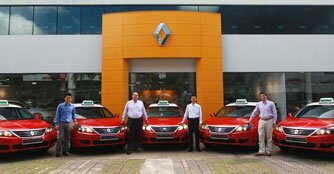 Singapore commuters will be cheered to know that Trans Cab Services Pte Ltd, Singapore's second largest taxi company, will start to roll out more than 500 2.0-litre Renault Latitude taxis from 18th July 2013. The Renault flagship luxury sedan, which is the tallest, widest and most spacious continental taxi in its class, will join the ranks of premium taxis in Singapore. Renault had on 11th April 2013 secured the contract to supply premium taxis to Trans Cab, following a similar contract the French marque had recently secured with a taxi company in Macau. Mr Christophe di Perna, Managing Director for Renault Singapore, said, "I am delighted by the recent success of our diesel ranges in Macau and Singapore. It shows the excellence of our engine technology and enables us to boost our presence in this part of the world, especially within the presence of environmental constraints." Mr Teo, Chairman and Managing Director of Trans Cab, said, "We are very pleased to be able to enhance the comfort and travel experience of our customers." With Renault Latitude being the largest and most spacious sedan in its class, it is no surprise that it is cherry-picked as the preferred choice for taxi drivers and their passengers to experience the outstanding roominess and comfort on a daily basis. This generously dimensioned sedan has an outstanding 4,885mm length, 1,832mm width, 1,495mm height, 1,025mm front and 1,101mm rear overhangs. Rear passengers get to enjoy a remarkable 253mm of knee room, as well as an elbow room of 1,474mm (front elbow room of 1,513mm). The Renault Latitude also comes with raised seat base for space optimisation and a large boot capacity of 477 litres. • ABS with electronic brakeforce distribution. • Emergency brake assist and automatic activation of hazard warning lights. • Adaptive driver and front passenger airbags. • Three-point seat belts with pretensioners and load limiter for all occupants. • Driver/front passenger Seat Belt Reminder. • Three-point Isofix anchorage for outer rear seats. Anyone drove from SG to Bangkok before? Any advice? Najib Announce VEP for Spore cars!